Handcrafted gombey dancer from Bermuda. Gombey folklore reflects the Bermuda’s mix of African, Native American, Caribbean and British inhabitants. This figurine is created on a needlepoint canvas. 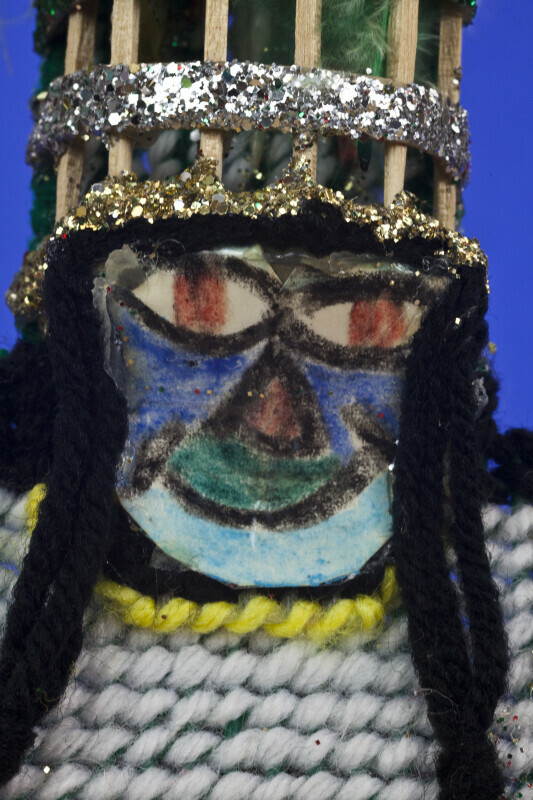 He has a face made of paper, and a hat created with toothpicks, glitter, and colorful feathers. His body is decorated with mirrors, tassels and yarn. The colorful headdresses, painted masks, and decorated costumes are all characteristics of gombey dancers. Tag says: "Bermuda gombey. Made in Bermuda by Lary Harvey." The figure is 11 inches (28 cm) tall.